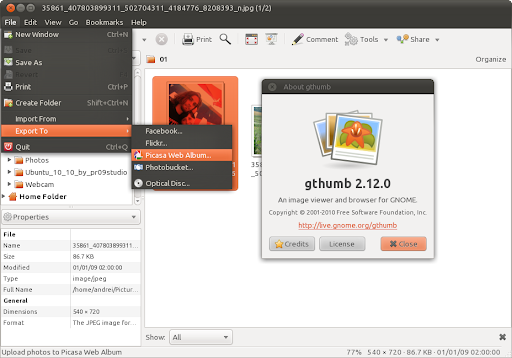 gThumb is an image viewer and browser utility for the GNOME environment. Finally, after a long period of development, a new stable gThumb version has been released: 2.12.0. We've been following the gThumb development here at WebUpd8 so you should already be up to date with all the changes. To mention just a few new features since the last stable version (not development! ): Facebook, Flickr, PicasaWeb and Photobucket export, import from Flickr and PicasaWeb, gThumb can now play videos and many many other new features and improvements which I'll not cover since we already talked about all of them throughout the gThumb 2.12 development posts (gThumb 2.11.x was the development branch for gThumb 2.12). You can read all about the gThumb 2.12.0 new features by browsing our gThumb posts. The latest gThumb 2.12.0 is also available in the main WebUpd8 PPA so if you're using it, you can also upgrade to 2.12.0 using that PPA.